Webcomics are still very young as a comic book medium. Here I explore the many facets of publishing comic books on the web. I will present ideas not only about the creation process of comics, but about the business end as well, which many comics authors may find valuable as a resource and reference for self-publishing webcomics (and print comics). 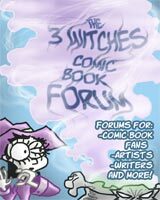 Articles are separated into two sections: "How To's", and "The Business of Webcomics."